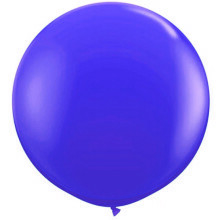 Make a statement at your next party with these huge 36" round balloons! Balloons look fabulous on their own, but you can also hang tassels, ribbon, or fringe from them to up the wow factor. Balloon colors change upon inflation. The colors shown here may appear different based on your screen monitor resolution. Helium quality (helium not included). Balloons are non-returnable. Children under 8 yrs. can choke or suffocate on uninflated or broken balloons. Adult supervision required. Keep uninflated balloons from children. Discard broken balloons at once.